Just prior to the beginning of the Fall 2012 semester, a pipe that connected the LoRise and HiRise apartments to the University power plant broke. As a result, the University has been providing the residents of these buildings with hot water through a large truck, which contains a boiler, located in the HiRise parking lot. The residents of the complex have not been notified of the pipe failure and there has been no concentrated effort to conserve water, according to Area Coordinator Brian Nangle. Grace Bomann ’14 said that she and her friends had not been notified and were unaware that a pipe had broken. According to Staye, specially designed joints, which expand when the temperature inside the pipe rises, connect the different sections of the pipe. He said that one of these joints malfunctioned in late August, and the pipe has since been turned off. The boiler that was brought in runs on oil that must be monitored and filled as needed. This past Sunday, Sept. 16, the boiler exhausted the oil supply and residents lost hot water in their apartments, according to Staye. As a result, Bomann said she didn’t have hot water for a few days last weekend. “I was away for two days and when I came back it was still an issue,” Bomann noted. Staye suggested a number of temporary solutions for affected apartments. He said he has narrowed them down to two viable solutions, which both involve running a flexible pipe through the existing pipe. Staye said that he expects the University to continue use of the boiler for six more weeks, at which time the temporary fix should be in place. “By the time we’re done with this, I could see the University spending $60,000 to $70,000 on the temporary fix, including the boiler and the fuel that goes into it,” he noted. The pipe also provides heat to the apartment complex. A larger boiler may be needed to meet the heating demands of the complex if the pipe is not fixed within the next several weeks. Fixing the broken pipe will take a few months, and Staye said the University will hire outside contractors to fix the pipe next summer. 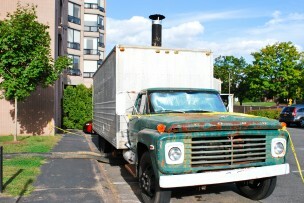 The truck’s boiler will continue to provide LoRise and HiRise with hot water until the pipe gets its temporary fix. “We’d ask everybody to be conscious of their hot water use, because the more you use, the less there is going to be for somebody else,” Staye said. With the amount we’re paying in tuition, this is really not okay.